First, down aisle one, we have one of the less interesting pieces to be displayed in here. Nothing really special about this one, aside from the spell effect. Probably my favorite one that I've done. Next, down the start of aisle two, we feature three scenes all using a template that I worked on a long time ago. 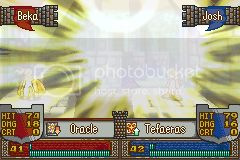 The first features a "custom" spell effect made from Gespenst, Bolting, and a spell effect from an RPG Maker sheet. 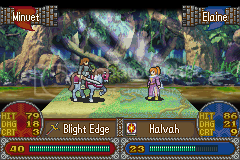 The second features (a bad) Eltosian sprite fighting against an "OC" Master Knight, using an Axe. 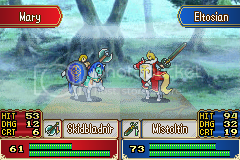 I personally like the "mist" efffect that was made by Colorizing the wind effect from Excalibur. 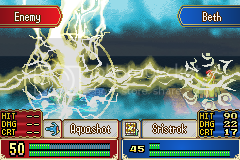 Fire Emblem could do with more weather effects in general, especially in battle. The final scene is the most recent, and the Rexcalibur effect was made by Miskantdhur. I like the scene, but it would have been nice to see Elaine's sprite instead. I still like these, and if I wasn't always busy, I'd think of making actual custom animations for it instead. Down the next aisle of antiquities, we have a more recent battle scene and template that I've done. Modeled after the Kirby series, a decent amout of the work on this was done from scratch, while looking at reference images. If you seen me around, you've likely seen the first image before, since it's been in my signature on various boards from time to time. I do like the scene, largely because I'm a snow kinda guy. Mage Knight 404 made the face sprite of Lucia. Similarly, Black Dragon created the face sprite being used as my personal face sprite. Made with Mage Knight 404's A Sacred Dawn battle template. Made with VincentASM's FEDS battle template. You can check these out at your leisure. Also, here's a link to my Custom Weapon Icon Tutorial, if that kind of thing interests you. First up, a generic compilation image. As with the above post, a large chunk of these icons are not natively GBA-friendly. If you see something interesting, let me know and I could possibly convert it. - The first six rows comprise icons that I've done mainly for my personal use in battle scenes, statsheets, etc. A decent handful of the first couple of rows were icons for a hack project that I had been working on as part of a group before it died due to the project lead disappearing from the internet for a long time. - The next row are GBA representations of the FE10 Dark Tomes (minus the last one, which should have been in the first set). - The next group of two rows are icons that I've done for Mage Knight 404's two ROM hacks, FE404 and FE: A Sacred Dawn. - The row below that contains icons that I made for Blazer a couple of years ago for his hack, PoD. - The next row down has icons that I made for flyingace24 and his hacks. - The row with two icons contains icons that I made for someone who decided to have the daunting task of running a FE map RP and creating statsheets for all of the allies and enemies that appeared on each map. Needless to say, it died off before I could ever finish the icons for it. - The last row contains icons that I've made that don't fit anywhere in the FE style of icons. This one is pretty self-explanatory. I never finished the sheet, mainly because Axe and Bow weapon icons tend to make me very aggravated (mainly Axe, but some Bows can be a pain). These should all be GBA-friendly, unless I happened to glance over one of the icons when I recompiled all of the ones I had done a few years ago. These were made for my pal, seph1212, for his FE8 hack that he is working on. They're mainly based on the artwork on Fire Emblem World for the icons, with the only exceptions being Gae Bolg, Gungnir, and, IIRC, Balmung. 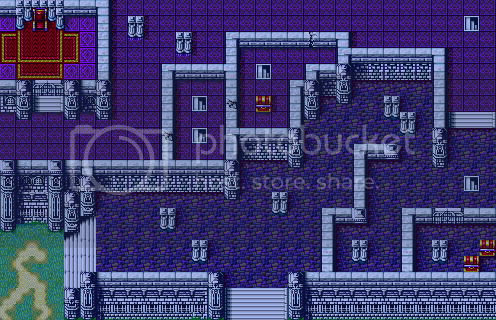 Aside from the notching on Ichival's arrow and the tome book structure, everything was sprited from scratch. - I primarily want feedback on the shading of the "castle towers" that will be the "name" box for the characters. There'll be more added there (to make it more readable and such), but I wanted to get the basic shading down first. Thanks for visiting LG's Sprite Warehouse! 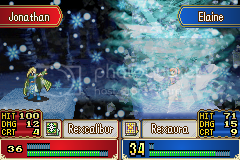 Hopefully the final FE4R template. Credit to Black Dragon of FESS for the avatar. Sweet battle screens and stat screens. Do you make any mugs? I will say that your battle template and stat sheets do you nice. I've tried making them myself but I've gotten flustered getting them to look nice. The first group of battle scenes are by far my favorite because I really enjoy looking at special effects. They are awesome. You didn't really show anything here that isn't your best work, I don't think, so I don't have anything bad to say, or any criticism. Thanks for sharing. When I first saw the shortened topic title I was like "LG's Sprite WAR?!" Would you mind sharing where you get your awesome effects from or no can do? 1) Most were found in RPG Maker sheets, IIRC. I just grouped them together and applied blending modes and opacity changes. - Scene 1: All were taken from Fire Emblem. - Scene 2: The mist is just frames from Excalibur. 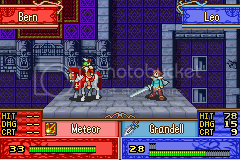 - Scene 3: Rexcalibur was sprited by Miskantdhur of FESS and was repositioned to fit the scene jointly by the two of us. 4) The snow was taken from KH:CoM (one of the enemies uses ice/snow, and it was adapted from that). 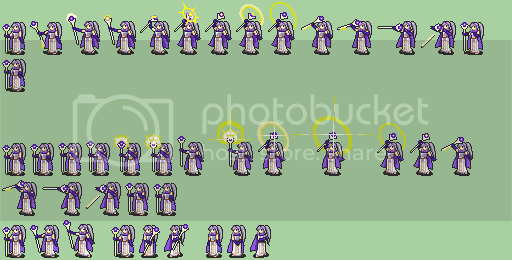 In general, when I even make scenes, I tend to pull from FE6-8's spells or from sprite sheets from other games that have been ripped, or from random sheets that I've seen on the 'net. Actual weather in battle would be amazing. So, if it's raining in a chapter, the battle would reflect it. Ambiance makes a world of difference in terms of player mood. I totally agree. They should have, at the very least, implemented that in FE9 or FE10. 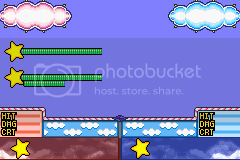 I can understand that adding any more than a weather map effect to the GBA games might be a little bit difficult or out of their way but since gaming is getting better in various ways (mainly graphics) one would think that the major console games would get enhanced graphical aspects added to them. Am I supposed to laugh at that? OH. PEOPLE, POST ON THIS AWESOME STUFF. I think it was very smart to use a GS background for it, as it fits with the colors and the characters, as well as the ground tiles they're standing on. I do enjoy that little pattern you put into the orbs. Makes it seem more medeival. YOU should try to make more battle animations. 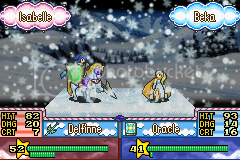 One thing I've noticed in all your battle scenes is that you make extremely creative sprites for characters, but there's never an animation. I've seen the one animation you made, and it's very well done. I think you'd make great animations. Credit to AoDnightshade of FEND for the EPIC banner. It's pretty awesome. Only complaint is that for longer names the text would be slightly harder to see due to the texture of the bricks. It looks pretty awesome, really. It is very full, it has way more than any of the GBA FE battle frames, that is definitely for sure. And...mind providing me something? Can you provide me a version of that frame alone, with no battle going on? I want to test if it is insertable. Should be. Yeah, I could see the text issue being a problem. Well, the borders anyway. I'm pretty sure that the text will stand out, given that it's white set against a darker background, but I guess the only thing I could do to check would be to throw a test name in and see. 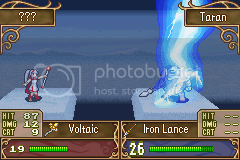 Eh, I'm not personally a fan of the backgrounds used in FE11. They don't have enough visible depth to them (well, at least some of them don't) to really work as backgrounds, IMHO. 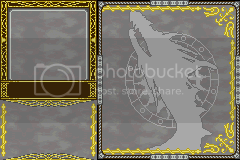 I mean, I could have not added the top and bottom fades to the Golden Sun background, but the GBA-style scene just looks better when it matches up to the existing engine style a bit. 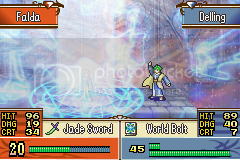 The frame is nearly identical to the one that was posted in the topic in Fire Emblem Editing. The only things that have changed are the shading on the circles (diameter/height hasn't), the color of the area where the weapons go, and the addition of the flags over top of the towers (with possibly a few touch ups here and there). Since the original intended version wouldn't fit without needing to be altered, I doubt that this personal finalized version will fit either. Urgh, bumped off of the first page. Oh well. Cue cross-post. Yeah, I made this a couple of years ago and never really posted it up or anything. 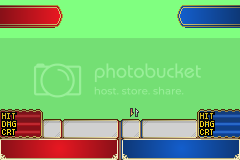 So, since I don't really have a lot to post at the moment while I work on a new template for FE4R, you guys get this. On the left stairs, the bottom two columns' bases are right next to each other, while the top two columns' bases are not. Of course, what you did makes sense for gameplay (same width) and I don't know that you'd really care to fix up a few-years-old map. You have wacky height problems on that first floor.